I wanted to remind everyone that time is running out on this give away. Here are the original details below! I’ve been super excited about posting this give away for the Flex Reaction Compound 88 Give Away. Flex Reaction is a small business based in Bangkok, Thailand and owned/run by Taradol Chansriwong who is constantly working on some great products. The Flex Reaction Compound 88 is a great example. 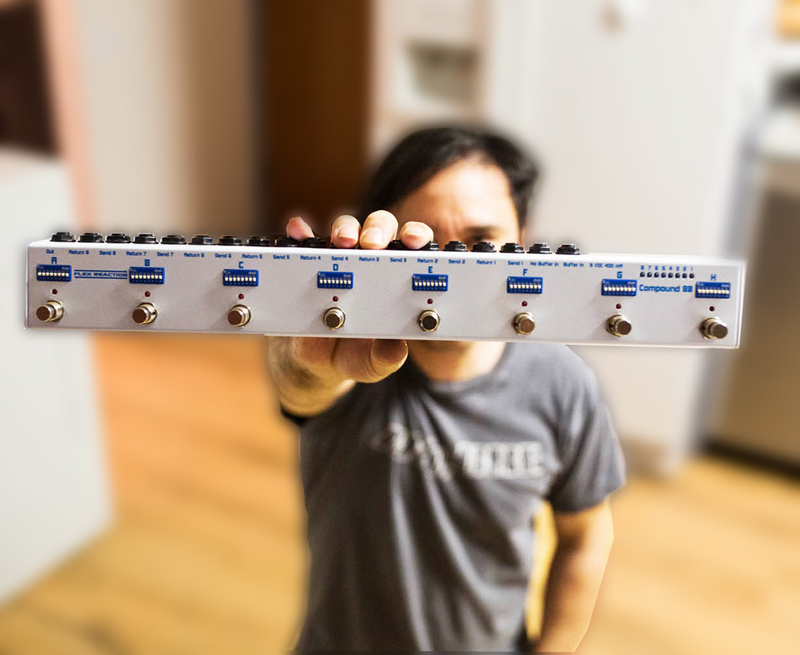 Here we have a 8 channel loop strip, but the reason why I particularly like this looper – it’s hardware programmable! You can assign in/outs on the looper via DIP switches, which I absolutely love. So if you wanted that reverb pedal to be on 4 loops, no problem. I’ve used simple loop strips in the past, it was a bummer dealing with the the one pedal per loop limitation. I know the larger digital/programmable brains solve this, but if you’re looking for a simple – this is your guy. I did a write up about – you can check that out here. This give away is open to international submissions. US winners will receive the pedal with free shipping, but if you’re selected as the winner AND international, we are asking that you pay for shipping. The value of the Flex Reaction Compound 88 is $319, so this is a great opportunity! But.. that’s not all. I’m also going to give up a set of Rattlesnake Cable Company Flex Patches. These patches will have a G&H Stubby Straight on one end to GLS Pancake on the other. The straights are perfect for a looping system like this. I’m offering 8 patches in total (so that cover 4 loops) – 2x 8″, 4x 12″ and 2x 18″. Retail value on the patches is $112, bringing the full retail value of this give away up to $431!! Be sure to submit bonus entries after your entry to gain additional opportunities to increase your odds! This give away is ending soon – I will stop accepting submissions on May 15th, 2018 at 11:59PM MDT. Don’t miss out on this one, and please help spread the word! We all love free gear, and making these give aways fun and successful for everyone! If you don’t see the form above, it could be related to ad block software/settings in your browser. You can go directly to the form by clicking here. Lotus Red Knob Give Away!